It’s easy to stay active at Algoma U. Whether you want to become an elite athlete or simply drop in for a fun game of intramurals, Algoma U has you covered. Get involved or cheer on our thunderbird athletes at a game! Algoma University is proud to be home to the Algoma University Thunderbirds Varsity Athletics Program and Boomer the Thunderbolt. Our student athletes participate in the Ontario University Athletics (OUA) and Canadian Interuniversity Sport (CIS) conferences, giving them the opportunity to compete in the highest level of sport in Canada. If you’re not into competitive varsity sports, you can still stay in shape and have fun by taking part in intramurals both on and off campus. Recreation is essential and should be included as part of students’ daily lifestyle. Our campus as well as the city of Sault Ste Marie offers many recreational options which you can explore below. Students can get physical at the George Leach Centre (GLC), Algoma U’s athletics complex. Did you know that access to the GLC is included in your tuition? Avoid the freshman fifteen by getting fit and having fun. 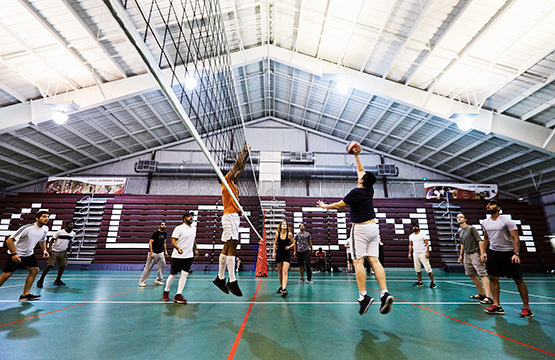 The field house features three regulation court surfaces, which accommodates a wide range of athletic activities such as badminton, basketball, volleyball, and tennis. One court has been specially designed with a dimple surface for better tennis play. The gym area is surrounded by a 1/9th mile indoor walking and jogging track. Bon Soo was first held in 1964 as a collection of events run by downtown businesses. Always ready to embrace the Northern Ontario Climate, organizers create giant bum slides made entirely of snow and ice at the waterfront downtown – enjoyed by both the young and young at heart. Dances, breakfasts, and a wide variety of performances and contests have become part of Bon Soo; ending with the chilling, thrilling polar bear swim! Algoma U often purchases Bon Soo buttons for students so that they can participate in the grand opening fireworks display, polar bear swim, and dog sledding, free of charge! The Community First Curling Centre is a top notch facility that has eight curling sheets, a full restaurant, equipment rentals and locker rooms and is located at 124 Anita Boulevard, Sault Ste. Marie, Ontario. This facility is the home of Team Jacobs who are the 2014 Olympic Men’s Gold Medal Curling Team, 2013 Canadian Men’s Curling Champions, and 2013 World Silver Medalists. As Northern Ontario’s premier Sports and Entertainment Facility, the Essar Centre provides a top notch home to the Soo Greyhounds of the Ontario Hockey League, and serves as a multi-sporting complex, venue for entertainment, tradeshows, conferences and much more. Since opening, the Essar Centre has hosted major concerts and special events including Cirque du Soleil, Brad Paisley, 2012 CARHA World Hockey Championships, Jerry Seinfeld, Mamma Mia, NHL preseason game Buffalo Sabres vs. Carolina Hurricanes, and the 2016 World U17 Hockey Challenge; just to name a few! For a full listing of major concerts and special events, see their Events Calendar. 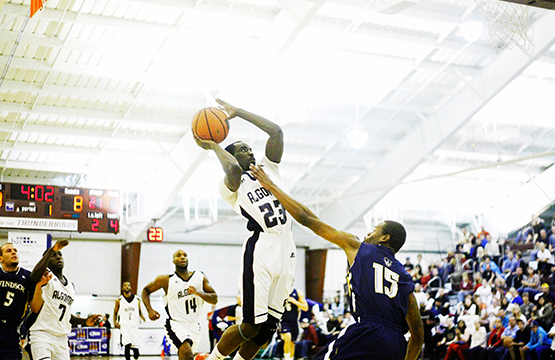 Algoma U hosts Greyhound games nights and students receive free tickets if they go to the game wearing AU colours. Hiawatha Highlands, located at 780 Landslide Road boasts over 40 years of cross country skiing excellence! This facility offers over 45 kilometres of ski trails (with 2 km of lighted trails until 10 pm) and 14 km of double track snowshoe trails. The trails offer both beginner and advanced systems that wind through the beautiful Northern Ontario winter landscape, including mountain bike and hiking trails in the other months. Located at the highlands is the Kinsmen Centre which is open seven days a week. The facility sells passes, rents equipment, has free parking and best of all, is only 10-15 minutes away from city. In between the great Canadian Shield, one of the oldest mountains, we have Searchmont Resort. Whether you cross country ski, snowshoe, ski or snowboard, there is something for everyone. All students are provided with a free season’s pass!. The mountain has the highest elevation of any ski resort in Ontario, covers 100 acres, and has 21 runs. The John Rhodes Community Centre is a first-class facility for hosting sporting competitions and other tourism related activities. This facility includes: a community ice surface, NHL ice surface, 25 metre – 8 lane pool, beach-front tot pool, gymnastic facilities, special function meeting rooms, lounge/restaurant, and food and beverage concession areas. Any student who shows their student card at any of the John Rhodes public skates or swims will be given free access. The John Rowswell Hub Trail is a 25 km multi-use non-motorized trail system that connects many significant points of interest including the waterfront walkway, Bellevue Park, Sault College, Fort Creek Conservation Area, and Algoma University. This trail system links together key cultural, historical, and natural areas of the community and community residents can use the trail as an alternative, environmentally friendly mode of transportation. Students can access the trail between Algoma University and Anna McCrea Public School. View the John Rowswell Hub Trail path (PDF).